The project was first announced in February 2018, and much of the cast joined that summer. Peele produced the film alongside Jason Blum and Sean McKittrick (with the trio previously having collaborated on Get Out and BlacKkKlansman), as well as Ian Cooper. Filming took place from July to October 2018 in California, mostly in Los Angeles and Pasadena, but also in Santa Cruz. Us had its world premiere at South by Southwest on March 8, 2019, and was theatrically released in the United States on March 22, 2019, by Universal Pictures. The film has grossed over $238 million worldwide and received praise from critics for Peele's screenplay and direction, as well as for the musical score and acting. In 1986, young Adelaide Thomas goes on vacation with her parents in Santa Cruz. At the beach, Adelaide wanders off and enters a funhouse, where she encounters a doppelgänger of herself in the hall of mirrors; Adelaide looks horrified, and the scene cuts to black. Adelaide is later reunited with her parents, although unable to speak. Her parents take her to see a therapist, because of presumed emotional trauma, who instructs them to encourage Adelaide to draw, sing, or dance to express her emotions. In the present day, a now-adult Adelaide heads to her family's beach house in Santa Cruz with her husband Gabe Wilson and their children, Zora and Jason. Adelaide, remembering the traumatic incident from her youth, is apprehensive about the trip; Gabe, eager to impress their rich friends Josh and Kitty Tyler, purchases a boat and brushes off Adelaide's concerns. At the beach, Jason sees a man in a red jumpsuit standing alone with blood dripping from his hands. He does not tell his family about the man. That night, a strange family of four appears, attacks the Wilsons, and breaks into the home. The Wilsons realize that the four intruders are doppelgängers of themselves, led by Adelaide's double, Red. Each of them are wearing the same jumpsuit as the man on the beach, and Jason's doppelgänger, Pluto, is wearing a white skintight mask. Red, the only doppelgänger who speaks, tells the Wilsons the story of a girl who lives a happy life, while her shadow suffers. The shadow is denied any love or companionship and is forced to eat a raw rabbit every time the girl eats. The shadow ends up hating the girl and vows revenge. The family is separated by their opposites: Red makes Adelaide handcuff herself to a table, Zora is pursued by Umbrae, Gabe is dragged onto the boat by Abraham, and Jason is sent to "play" with Pluto in the closet. While chasing Zora, Umbrae is interrupted by an investigating neighbor, whom she stabs with scissors; the distraction allows Zora to escape. Gabe is able to kill Abraham with his boat's intermittently malfunctioning motor, while Jason discovers that Pluto mirrors his actions almost exactly. He is able to distract Pluto with a magic trick and lock him in the closet. Red is drawn to Pluto's cries, allowing Adelaide time to break free. The family regroups and escapes on Gabe's boat. Meanwhile, the Tylers are murdered by their doubles. The Wilsons arrive and realize the same thing has happened to the Tylers. They kill the Tylers' doubles, and turn on the news to see that millions of doppelgängers, who call themselves "the Tethered", have been murdering their original counterparts nationwide. The doppelgängers subsequently join hands together to form a massive human chain, which the newscasters speculate is a form of protest. The Wilsons drive away in the Tylers' car, until they are attacked by Umbrae, who is killed after being launched into a tree. As day breaks, the Wilsons arrive at the Santa Cruz boardwalk, where they find their own abandoned wagon on fire. Pluto has set a trap to kill the Wilsons by lighting a gasoline trail to the Tylers' car. Jason, remembering that Pluto mirrors his every move, walks backward. Pluto follows, walking backwards into the flames, and is killed. While the Wilsons are transfixed by Pluto's self immolation, Red reappears and abducts Jason. While Zora and Gabe recuperate in an abandoned ambulance, Adelaide returns to the boardwalk funhouse and walks through a secret tunnel in the hall of mirrors. This leads to an underground facility overrun by rabbits, where Adelaide finds Red. Red states that the Tethered were clones of the U.S. population created by the government in an attempt to control the public, but the experiment failed and the Tethered were abandoned underground for generations, trapped beneath the surface, doing nothing but forced to mimic the actions of their above-ground counterparts, until Red organized them to escape as a form of revenge. The two fight, and Adelaide manages to kill Red, and rescue Jason. When the family leaves town, Adelaide thinks back to the night she first met Red in the funhouse. It is revealed that Red strangled Adelaide and dragged her into the facility, chaining the real Adelaide to a bed in the facility, and went out to take her place in her life, meaning Red is the original Adelaide. Jason watches her apprehensively, before covering his face with his mask. As the family drives off, helicopters watch the Tethered joining hands across the United States. 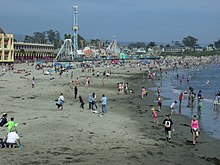 Shooting took place at the Santa Cruz Beach Boardwalk. After being dismayed by the "genre confusion" of Get Out, Peele opted to make Us a full-on horror film, which was described by Rolling Stone as "spill-your-soda scary" compared to the "existentially terrifying" Get Out. Peele has said that an inspiration for Us was The Twilight Zone episode "Mirror Image" that was centered on a young woman and her evil doppelgänger. Principal photography began on July 30, 2018 in Santa Cruz, California, including the Santa Cruz Beach Boardwalk. Most of the film was shot in Los Angeles, and the main house featured is located in Pasadena. The house had modifications and the team spent six weeks there. Filming wrapped on October 8, 2018. The visual effects were provided by Industrial Light & Magic and supervised by Grady Cofer. Michael Abels, who had previously scored Peele's Get Out, returned to do the same for Us. Manohla Dargis of The New York Times notes that the Wilsons are "introduced with an aerial sweep of greenery" similar to the opening of Stanley Kubrick's The Shining and sees that movie as the principal influence on Us. Describing Peele as a "true cinephile", she also identifies allusions to other films, including Jaws (1975), A Nightmare on Elm Street (1984), and The Goonies (1985), as well as one scene suggesting an influence by the Austrian film director Michael Haneke. Critic Jim Vejvoda related the Tethered to "urban legends" and "xenophobic paranoia about the Other", also writing they resembled the Morlocks in H. G. Wells' 1895 novel, The Time Machine. Journalist Noel Ransome viewed the film as being about "the effects of classism and marginalization", writing "the Tethered are effigies of this same situational classism. They're trapped—mentally and physically—and ignored". Joel Meares of Rotten Tomatoes also noted that the Tethered, referencing the "we're Americans" line, are representatives of the duality of American society, how some citizens can afford to live on top of the class system, while others are stuck in illiterate poverty. He also noted the title Us could mean "U.S.", or United States. The Tethered's red jump suits and single glove were also noted as imagery to Michael Jackson (along with the "Thriller" shirt seen on young Adelaide), and Peele has stated that Jackson was "the patron saint of duality". The film contains numerous references to Jeremiah 11:11, which reads: "Therefore this is what the Lord says: 'I will bring on them a disaster they cannot escape. Although they cry out to me, I will not listen to them'" (NIV). Critic Rosie Fletcher commented on the context, with Jeremiah warning Jerusalem was facing destruction due to false idols, and expressed the opinion that the film's characters also "worshiped the wrong things", such as Ophelia, the virtual assistant. The official trailer was released on December 25, 2018. The trailer, which was set to a darker version of the song "I Got 5 on It" by Luniz, featured a similar tone, editing, and shots as Peele's Get Out, prompting speculation that the two films were set in the same universe. A second trailer was released on February 3, 2019 for Super Bowl LIII. The trailer features a narration by Lupita Nyong'o's character Adelaide, speaking with her husband Gabriel about the strange coincidences happening since they arrived at their beach house, and describing it as a "black cloud" hanging over them. The new theatrical release date, March 22, was announced at the end of the trailer. Deadline Hollywood estimated the studio spent around $77 million on promotion and advertisements for the film. Us had its world premiere at the South by Southwest festival on March 8, 2019. The film was originally scheduled for theatrical release in the United States on March 15, 2019, but was pushed back a week to March 22, following the announcement of its festival premiere. As of April 17, 2019[update], Us has grossed $165.5 million in the United States and Canada, and $72.5 million in other territories, for a worldwide total of $238 million, against a production budget of $20 million. In the United States and Canada, initial tracking had Us grossing $35–40 million in its opening weekend. By the week of its release, estimates had risen to $45–50 million, with advance ticket sales on Fandango outpacing A Quiet Place ($50.2 million) and Get Out ($33.7 million). The film made $29.1 million on its first day, including $7.4 million from Thursday night previews, one of the best-ever for a horror film and far higher than the $1.8 million Thursday grossed by Get Out, increasing weekend estimates for Us to $68 million. It went on to debut to $71.1 million, the second best opening for a live-action original film after Avatar ($77 million in 2009), as well as the third-best total for a horror film after It ($123.4 million in 2017) and Halloween ($77 million in 2018). In its second weekend the film made $33.6 million, dropping 52.7% (slightly above-average for a horror film but much larger than the 15% seen by Get Out), finishing second behind newcomer Dumbo. On review aggregator Rotten Tomatoes, the film holds an approval rating of 94% based on 437 reviews, with an average rating of 7.95/10. The website's critical consensus reads, "With Jordan Peele's second inventive, ambitious horror film, we have seen how to beat the sophomore jinx, and it is Us." On Metacritic, the film has a weighted average score of 81 out of 100, based on 55 critics, indicating "universal acclaim". Audiences polled by CinemaScore gave the film an average grade of "B" on an A+ to F scale, while those at PostTrak gave it an overall positive score of 80% and a 60% "definite recommend". Monica Castillo of RogerEbert.com gave the film four out of four, writing that: "Us is another thrilling exploration of the past and oppression this country is still too afraid to bring up. Peele wants us to talk, and he's given audiences the material to think, to feel our way through some of the darker sides of the human condition and the American experience." David Griffin of IGN gave the film 9.0/10, calling it "a very, very strange film. But that's OK because it wouldn't be a Jordan Peele joint if there wasn't a little risk involved. Peele has proven that he's not a one-hit-wonder with this truly terrifying, poignant look at one American family that goes through hell at the hands of maniacal doppelgangers". John DeFore of The Hollywood Reporter described Us as "a fiercely scary movie whose meaning is up for grabs". Richard Brody of The New Yorker described the film as a "colossal achievement," writing that, "Us is a horror film—though saying so is like offering a reminder that The Godfather is a gangster film or that 2001: A Space Odyssey is science fiction. Genre is irrelevant to the merits of a film, whether its conventions are followed or defied; what matters is that Peele cites the tropes and precedents of horror in order to deeply root his film in the terrain of pop culture—and then to pull up those roots." Conversely, Stephanie Zacharek of Time thought Peele had too many ideas and not enough answers compared to Get Out, writing, "Peele goes even deeper into the conflicted territory of class and race and privilege; he also ponders the traits that make us most human. But this time, he's got so many ideas he can barely corral them, let alone connect them. He overthinks himself into a corner, and we're stuck there with him." ^ "Us". AMC Theatres. Retrieved March 5, 2019. ^ a b c "Us (2019)". Box Office Mojo. Retrieved April 18, 2019. ^ a b "Us (2019)". The Numbers. Retrieved April 18, 2019. ^ Ryan, Mike (March 19, 2019). "Jordan Peele On Why He Hid Three Corey Feldman Easter Eggs In 'Us'". Uproxx. Uproxx Media Group. Retrieved March 1, 2019. ^ Vargas, Alani (March 2019). "Jordan Peele's 'Us' Cameo Is Very Hard To Spot, But Impossible To Forget". Bustle.com. Retrieved March 26, 2019. ^ Peele, Jordan (March 17, 2019). "'Us' is a horror movie". Twitter. Retrieved April 6, 2019. ^ a b Hiatt, Brian (January 29, 2019). "The All-American Nightmares of Jordan Peele". Rolling Stone. Retrieved February 1, 2019. ^ Pereira, Alyssa; SFGATE (September 13, 2018). "Jordan Peele filming movie in Santa Cruz with Lupita Nyong'o, Elisabeth Moss, Winston Duke". SFGate. Retrieved February 28, 2019. ^ D'Alessandro, Anthony (July 30, 2018). "Jordan Peele's 'Us' Starts Production, Rounds Out Cast". Deadline Hollywood. Retrieved July 30, 2018. ^ "Us - The Art of VFXThe Art of VFX". www.artofvfx.com. Retrieved December 25, 2018. ^ Parisi, Paula (March 22, 2019). "Michael Abels on Delivering a Frightfully Good Score for Jordan Peele's Horror Flick 'Us'". Billboard. Retrieved March 24, 2019. ^ Dargis, Manohla (March 20, 2019). "'Us' Review: Jordan Peele's Creepy Latest Turns a Funhouse Mirror on Us". The New York Times. ^ Vejvoda, Jim (March 23, 2019). "Us Movie Explained: Hands Across America, Jeremiah 11:11, And The Tethers". IGN. Retrieved March 23, 2019. ^ Ransome, Noel (March 25, 2019). "Jordan Peele's 'Us' Is Not-so-Secretly About Class". Vice.com. Retrieved March 26, 2019. ^ a b Meares, Joel (March 28, 2019). "Jordan Peele's Us Explained: The Big Twists, References, Themes, And Allusions". Rotten Tomatoes. Retrieved March 29, 2019. ^ Thompson, Rachel (March 19, 2019). "Jordan Peele explains the significance of the Michael Jackson imagery in 'Us'". Mashable. Retrieved March 29, 2019. ^ Fletcher, Rosie (March 23, 2019). "Us: How Jeremiah 11:11 Fits in Jordan Peele Movie". Den of Geek. Retrieved March 23, 2019. ^ "Us - Official Trailer [HD]". www.youtube.com. YouTube. Retrieved December 25, 2018. ^ Jared Richards (December 27, 2018). "Here's Why Fans Think Jordan Peele's Next Film 'Us' Is Connected To 'Get Out'". Junkee. Retrieved December 27, 2018. ^ Kaplan, Ilana; Kaplan, Ilana (February 3, 2019). "Jordan Peele's 'Us' Reveals New Trailer Ahead of Super Bowl". Rolling Stone. Retrieved February 3, 2019. ^ a b c D'Alessandro, Anthony (March 24, 2019). "How Universal Drove Jordan Peele's 'Us' To $70M+ Opening, The Best Start For A Live-Action Original Since 'Avatar' – Update". Deadline Hollywood. Retrieved March 24, 2019. ^ McNary, Dave (January 8, 2019). "Jordan Peele's 'Us' to Open SXSW Film Festival". Variety. Retrieved January 8, 2019. ^ D'Alessandro, Anthony (January 8, 2019). "Jordan Peele's 'Us' To Hit Theaters A Week Later After Landing SXSW Opening Night Slot". Deadline Hollywood. Retrieved January 8, 2019. ^ D'Alessandro, Anthony (February 28, 2019). "Jordan Peele's 'Us' Eyes $35M-$40M Opening – Early Look". Deadline Hollywood. Retrieved February 28, 2019. ^ D'Alessandro, Anthony (March 19, 2019). "Jordan Peele's 'Us' To Leave 'Captain Marvel' In The Dust With $45M-$50M Opening". Deadline Hollywood. Retrieved March 19, 2019. ^ D'Alessandro, Anthony (March 25, 2019). "Jordan Peele's 'Us' Powers To $71M+ Opening, A Major Win For Original Fare At The Box Office – Monday AM Update". Deadline Hollywood. Retrieved March 25, 2019. ^ D'Alessandro, Anthony (March 31, 2019). "'Dumbo' Hovers Low With $46M+ But Hopes On Matinees; Matthew McConaughey Hits Bottom With $1.7M 'Beach Bum'". Deadline Hollywood. Retrieved March 31, 2019. ^ "Us (2019)". Rotten Tomatoes. Fandango Media. Retrieved April 18, 2019. ^ "Us Reviews". Metacritic. CBS Interactive. Retrieved March 26, 2019. ^ Castillo, Monica. "Us Movie Review & Film Summary (2019) | Roger Ebert". www.rogerebert.com. Retrieved March 9, 2019. ^ Griffin, David (March 9, 2019). "Us Review". IGN. Retrieved March 9, 2019. ^ DeFore, John (March 8, 2019). "'Us': Film Review - SXSW 2019". The Hollywood Reporter. Retrieved March 21, 2019. ^ Brody, Richard (March 23, 2019). "'Review: Jordan Peele's "Us" Is a Colossal Cinematic Achievement". The New Yorker. Retrieved March 23, 2019. ^ Zacharek, Stephanie (March 15, 2019). 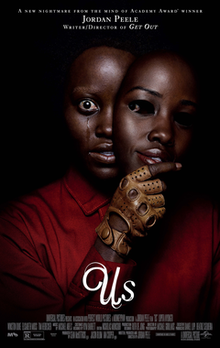 "Review: Jordan Peele's Us Is Dazzling to Look At. But What Is It Trying to Say?". Time. Retrieved March 21, 2019.